The accumulation of aluminum in tissues has been implicated in the pathogenesis of several clinical disorders of the musculoskeletal, central nervous, and hematologic systems [1–4]. 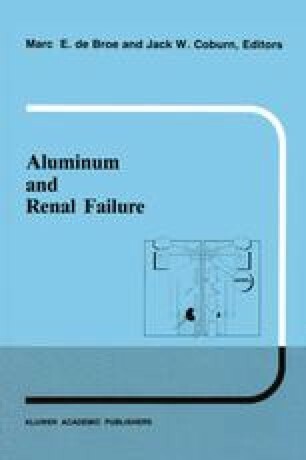 Early clinical reports suggested that aluminum deposition in brain was related to the development of a progressive and lethal encephalopathy in patients receiving maintenance hemodialysis. Many patients with the syndrome of dialysis encephalopathy, or dialysis dementia, also exhibited clinical manifestations of a severe form of osteomalacia characterized by recurrent fractures and progressive muscle weakness [5,6]. This disorder was usually refractory to treatment with active vitamin D sterols, and several clinical and biochemical features distinguished it from other types of renal osteodystrophy [7–9]. Subsequent investigations documented that patients with concurrent manifestations of dialysis- associated osteomalacia and encephalopathy had extensive deposits of aluminum in bone [10, 11]. Water that contained aluminum and that was used for the preparation of hemodialysis solutions was the predominant source of aluminum loading in these patients [2, 12, 13].